A primary school pupil’s twin obsessions of reading and drawing have won her the top prize in a design competition run by the Grammar School at Leeds (GSAL) at the Ilkley Literature Festival. 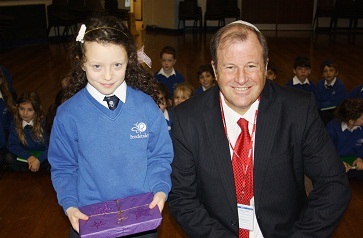 GSAL’s Principal, Mike Gibbons, presented the prize to Leanna at assembly in Brodetsky Primary School, congratulating her on being selected from almost 60 entries for the creativity and artistic flair she showed with her exciting fictional title and eye-catching design. GSAL was the main sponsor of the Children’s Festival at Ilkley and children who visited the Children’s Weekend in October were invited to enter the competition by designing a book cover for either their favourite book or a story of their own invention. Two runners up each received a book token. 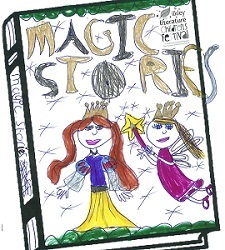 They were Jojo Lyons, aged 8, All Saints Primary in Ilkley, with her spooky entry ‘The Haunted House’ and Rebecca Rose, aged 9, Embsay Primary School, who designed a brilliant ‘Bad Girls’ cover.